Cannabis 101: Stop the Confusion! The Truth About CBD In this hands on, interactive presentation we will remove the confusion and discuss the proper use of CBD to get specific results for specific conditions. The Truth About CBD: - What is CBD? 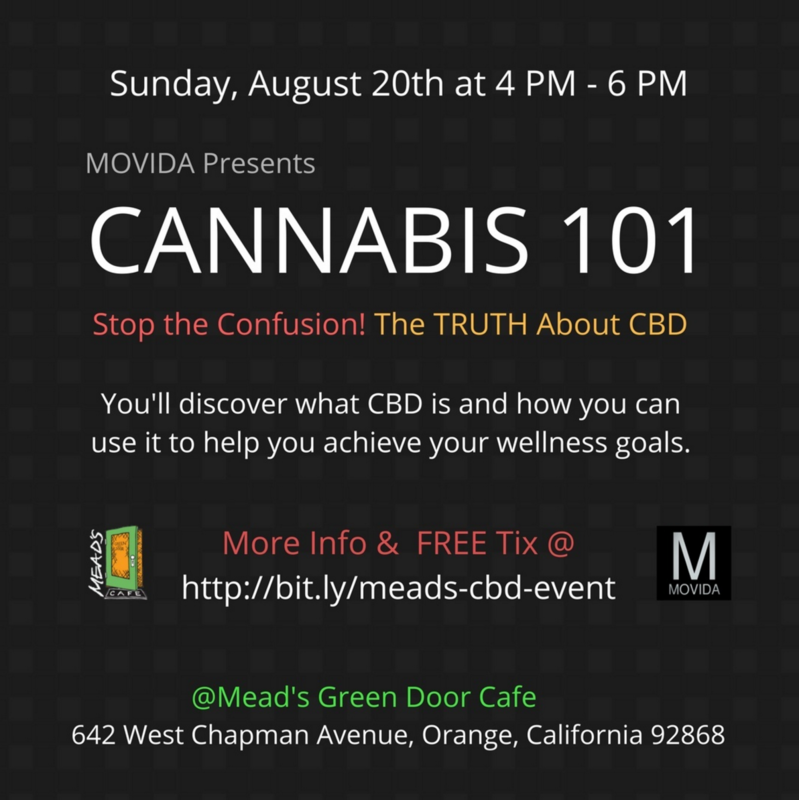 MOVIDA's Cannabis 101: This Meetup event is part of a series of Meetups geared towards informing and educating our members about all things Cannabis and how it relates to MOVIDA's Integrative Wellness Plan. We will have an interactive discussion, basically uncovering the veil surrounding Cannabis CBD. You will leave with a better understanding of what CBD is, the various forms or methods of ingestion, and how it can help you achieve your Health & Wellness goals quicker and safer than more traditional methods. It's going to be a Fun and Informative evening. CBD Interactive Display The MOVIDA Good Vibe Crew will have a booth set up to answer any questions. We will also have our full line of CBD products on-hand for you to see, touch and taste... Giving you the opportunity to fully immerse yourself in the experience in a safe and friendly environment. FREE Stuff: MOVIDA will be raffling it's signature products throughout the night. The raffle is free to enter. And, you need to be present to receive your prize. Note: After the presentation there will be time to mingle with each other and have some fun.